The civil wedding ceremony has a reputation of being a bit dry and official. Get in, agree into everything the officiant says, sign the book, get out. Done. Married. That’s not the whole truth! 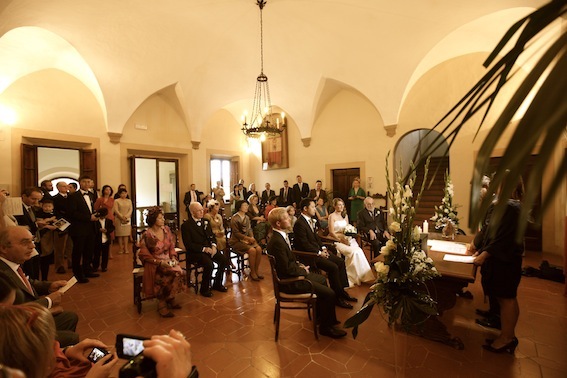 The civil wedding ceremony in Italy is not that official. It can be a beautiful and a unique moment, where you can also add your own wedding vows, readings and music. Let’s have a closer look at the civil ceremony, how does it normally flow and what are you saying ‘si’ to really? Some towns celebrate weddings also in private locations, such as villas and castles, where you can organise the wedding reception. This is still a limited possibility and you always need to make a specific request for the space you wish to use, for a certain day and time. 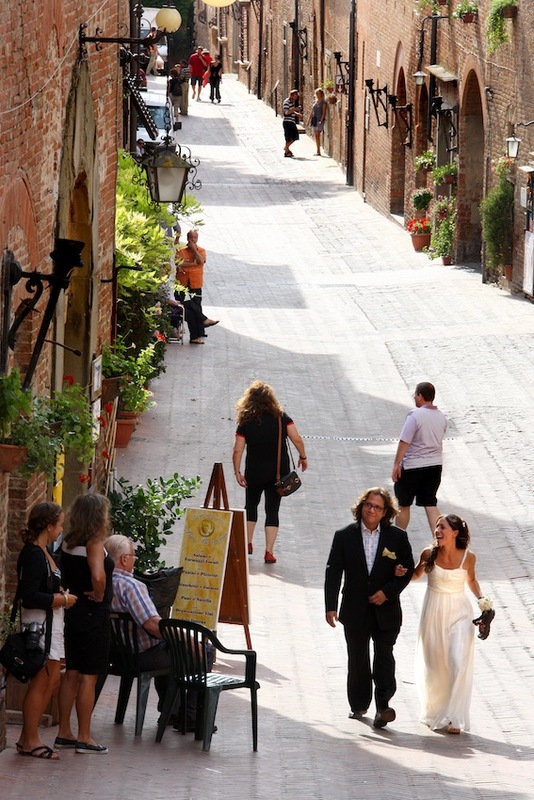 We will be in contact with the municipality and inform you about what is available in the area of the wedding. Depending on the administration’s own schedule, the bookings already made and whether the ceremony is celebrated during the office hours or outside the office hours, the officiants will confirm their availability and costs for the chosen wedding date. – Brides arrival to the ceremony. – Signing of the register. – Married couples exit from the ceremony. There can also be played music while the guests arrive and some time after the ceremony. Live musicians know when to play and when to tone out. Civil Wedding Vows: The officiant is one of the town’s administration, a register or sometimes the mayor of the town. He or she will first greet the spouses and their guests. Then the celebrant will identify the spouses by asking their names and whether they are here present of their own free will. The spouses will reply yes to this question. 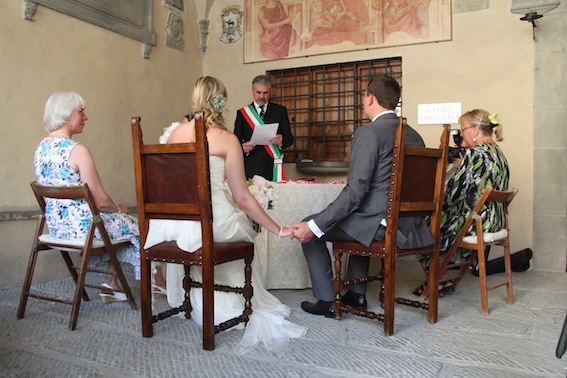 Then the celebrant will proceed by reading 3 articles from the Italian civil code, one by one, in Italian. The articles will be translated in your own language, simultaneously, by official interpreter, who has sworn according to the law. You can reply in your own language. Article 143: Reciprocal rights and duties of the husband and wife. Upon marrying, the husband and wife acquire the same rights and assume the same duties. The state of matrimony requires a reciprocal obligation to fidelty, to moral and material assistance, to collaboration in the interest of the family and to cohabitation. Both the husband and wife are expected to contribute to the needs of the family, each pledging in relation to their own financial circumstances and personal capacity, relative to their profession, whether inside or outside the family home. Article 144: The address of the family home. The husband and wife will agree together on the physical address of their home and establish the family residence according to the needs of both, and of the pre-eminent needs of the family itself. It is within the power of each of the spouses to bring the agreed upon address, into being. Article 147: Duties regarding children. The state of matrimony requires from both the husband and wife the duty of supporting, raising and educating their children, keeping in mind their natural abilities, their inclinations and aspirations. After reading of the articles, the celebrant will make the question. Celebrant: I invite you to answer to the following question. Celebrant: Further to their respective declarations in the affirmative, I hereby announce, in the name of the law that nn and nn are united in matrimony.!! Kissing the bride, followed by some clapping and cheering from the guests side is highly anticipated! Exchange of the wedding rings (The celebrant and the translator will give a sign). 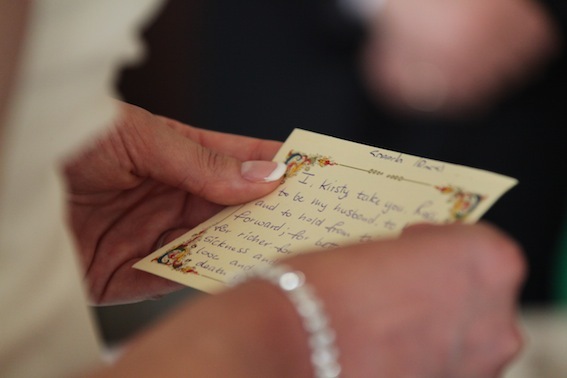 Your Own Vows: We need to agree in advance with the celebrant, where you can add your own vows. In most cases, the celebrant does not wish to brake the reading of the articles. 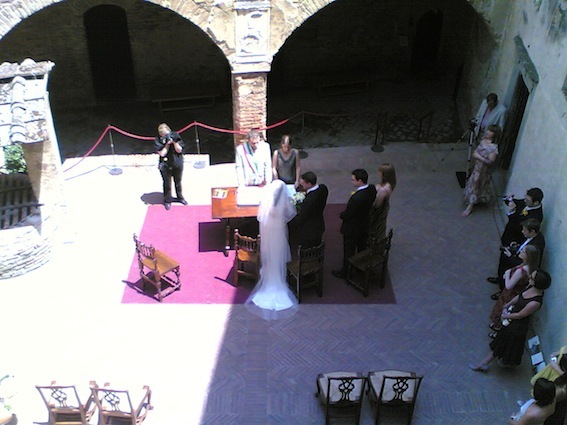 One suitable spot where to add your own vows is immediately before or during the exchange of the rings. The Readings: You can have your own readings, red by the chosen persons among the wedding guests. Again we need to agree with the celebrant, when these readings may take place. A suitable moment is before the articles / before the ‘question’ or after the exchange of the rings. If you have more readings, these can be shared before and after the legal part. The ceremony is brought to an end by reading of the legal marriage act. This is the full text of the official marriage register, that will be filed at the town hall. The act will be translated during the reading. The celebrant will often hold short speech to the newly wed couple on behalf of the town hall administration. When the ceremony is over, the couple can walk down the aisle all the way to the main door, or another area that we will agree in advance. The guests walk down, greet the couple, inside or outside the town hall. This is a good moment to take group pictures. Once you arrive to the wedding reception, they will get busy with food and drinks, and you will lose the crowd! Throwing of the confetti: This can only happen outside the town hall. In Italy the tradition is to throw rise, that symbolises good luck and fertility, but many town halls kindly ask the guests to use natural flower petals instead. (It’s hard to clean the rise from cobblestoned roads, and it’s not good for the birds who might eat the rise.). 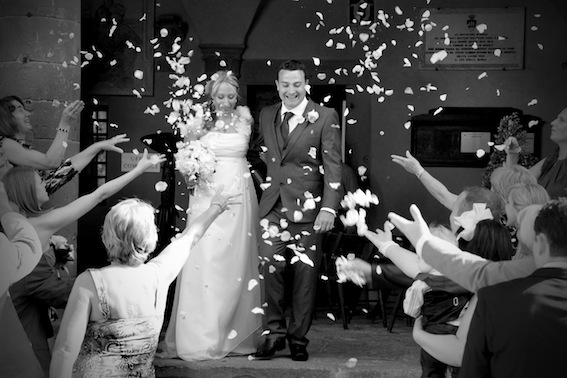 We can help the guests to be lined up in two lines, share out the confetti and coordinate the throwing. (Organised petal throwing helps getting good pictures!). After The Ceremony: Depending where the ceremony will be and the distance to the wedding reception location, there can be organised a toast in the spaces of the townhall (if suitable) or in a local bar. On a hot day a fresh and bubbly Prosecco and some water may be well received, before getting into the bus and making the road to the wedding reception venue. 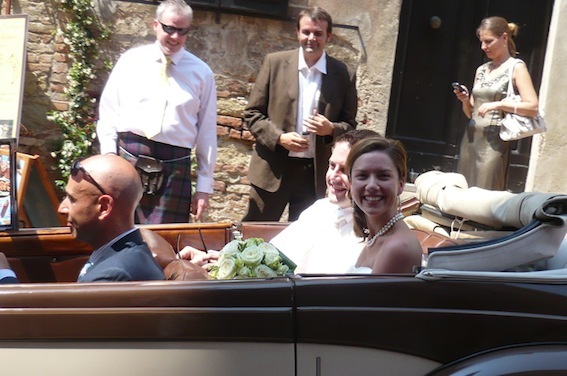 If you have rented a cool vintage wedding car, this is the moment to show it! The guests will greet you and make the way right after you in shuttle buses to start the wedding reception at the venue. In most cases the couple will drive away with the wedding photographer to take pictures in the nearby panoramic spots and arrive to the wedding reception shortly after the guests. We will organise all the needed permits for the cars that will need to enter close to the town hall. This is necessary in most towns, with limited traffic area. Another great thing about having the ceremony at a local town hall, is that you get to be a part of the town’s daily life. Don’t be surprised if you can see the local ladies lined up with their chairs right next to the town hall, or people looking from windows and shouting their congratulations to you. They are celebrating with you! Evviva gli sposi! 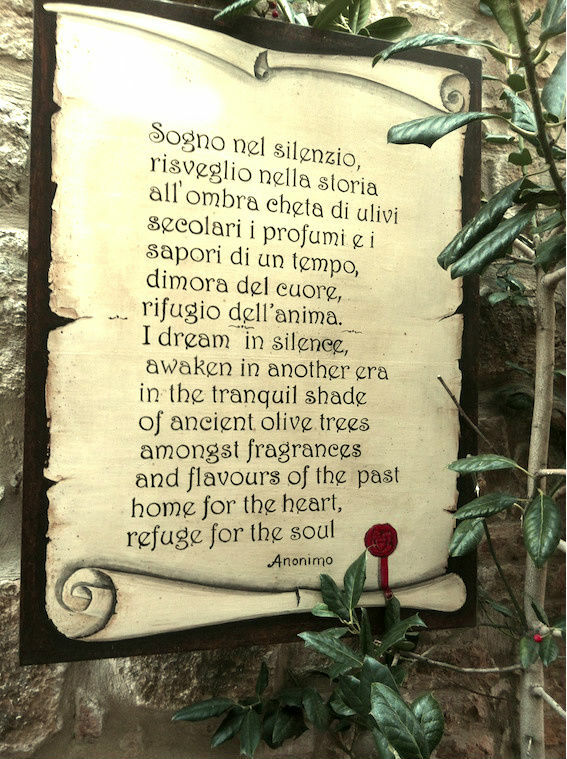 Per cento anni!